High school racing trips mean high school kids cooking. Read about the Ford Sayre kids’ experience with skiing on the team’s blog. I started cross-country skiing in an organized way when I was 15, a sophomore in high school. Before that I had grown up skiing on fishscales, clomping around on the trails behind my grandfather’s house, which were groomed by a devoted local skier (Mike Smith, town hero!) and his snowmobile. We knew that skating existed and every once in a while my mother would try it for ten strides or so, but her skis were classic skis from before skating was even invented and so it wasn’t very practical. As for me, I lived in ignorance. But in high school it became clear that my career as a basketball player wasn’t going anywhere. I joined the ski team because I had run cross-country and many of my friends skied. It seemed logical. Besides joining the high school team I also enrolled with the Ford Sayre club, a local program with a higher racing focus which practiced two times a week. By the end of the year I entered my first regional races: the Eastern Cups in Hanover (on my home course at Oak Hill) and Holderness, New Hampshire. I finished last and second to last. Luckily things improved in subsequent seasons! I raced many more Eastern Cups with Ford Sayre, then with Dartmouth, and then with the Craftsbury team after graduation. And after I stopped ski racing seriously, I kept going back to the first Eastern Cups of the season when I was home for Christmas to coach for Ford Sayre, my original club. At the first big races of the season things are always a little hectic so they are happy to have an extra helper on hand. Each year I get to check in with the kids who are coming up through the program, and it’s a blast. 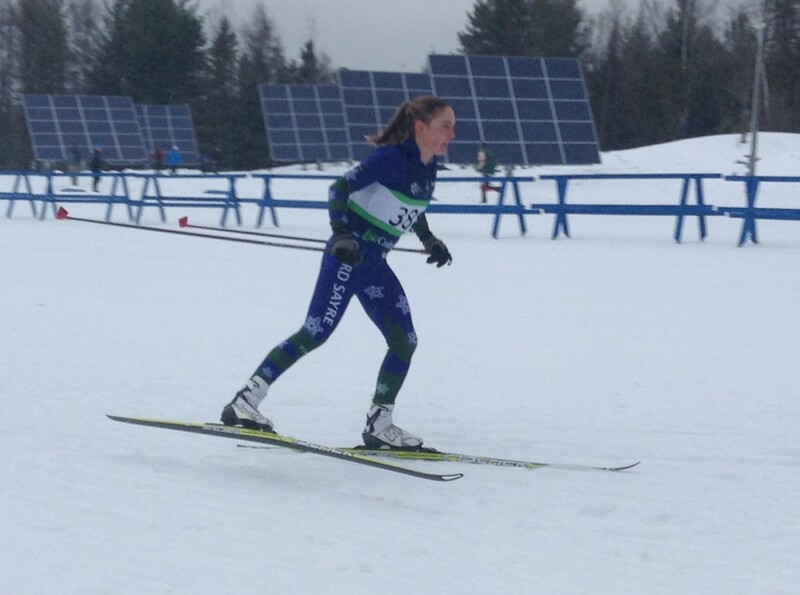 This year I was particularly excited to go to the Eastern Cup because it was in Craftsbury, Vermont, on my old stomping grounds. With so little snow in Europe, I was excited to bring my skis home and go for long distance skis around my favorite Craftsbury trails – finally, some good training! My boyfriend was also coming to help coach, and he had never been to the Outdoor Center or that area of the Northeast Kingdom. I was doubly excited to show him the trails. ….. then I actually took a look at the snow situation in New England. Craftsbury did an amazing job pulling off races at all, especially since it rained two days before the races and reduced the snowpack on the manmade loop down about as low as it could go. But a kilometer was as much as they could muster. My boyfriend and I brought our running shoes and explored the trails that way. It was still fun. What I love about Eastern Cups is that they have something for everyone – from top seniors vying for international race spots who treat the races as training tests, down to high school athletes jumping in their first regional races – and that the entire ski community of Eastern North America shows up. I could catch up with so many old friends in one place, and trade cards and Christmas presents too! I would have loved to go for a ski with my friends who are now coaching full time, but we stuck to chatting on the side of the trail given the conditions. 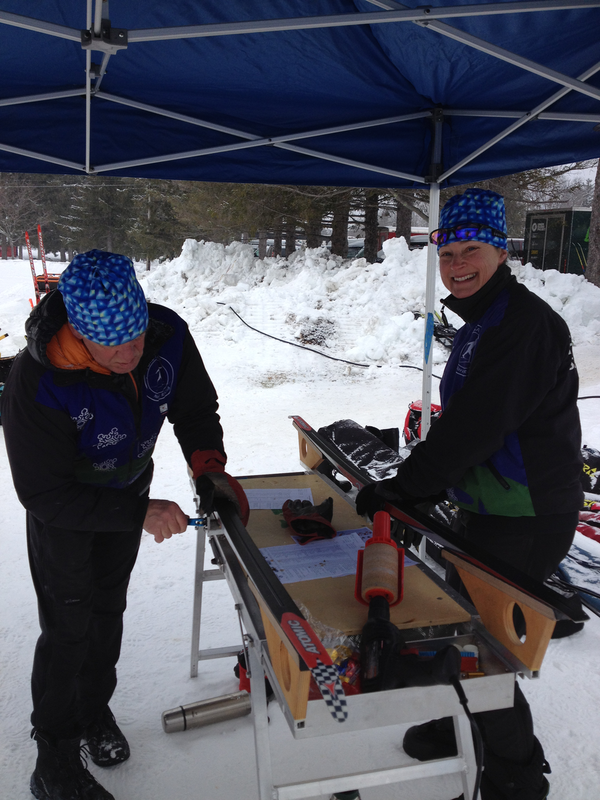 Ford Sayre coaches Scottie Eliassen (right) and Dennis Donahue under the wax tent in 2014. A ski race is a ski race is a ski race, and one of the things that has gotten me through my 2 1/2 years in Europe is that you can show up to ski anywhere and things are basically the same and people are friendly and nice. But the Eastern Cup is particularly familiar, whether it is Pavel Sotskov’s announcing or walking by tables full of food for various clubs and college teams where athletes, coaches, and parents all congregate post-race. I also particularly enjoy going with Ford Sayre. Every year it’s a reminder of what I learned from the club about how to be an athlete. Before every race, each athlete has to come check in with the coaches to talk about two (no more, no less) specific objectives for the competition – be it a technique cue, something about pacing, a mental aspect, or just the process of the race from warm-up to cool-down. At the end of the day, the athletes cook dinner and we all sit around a big table as a team. Each athlete says one thing that went well for them, and one thing that they want to improve on in the next race. Then the coaches do the same thing. The club always has a good system of setting short- and long-term goals, and revisiting them when appropriate. It teaches athletes early in their careers to have purpose and to do things for a reason. That’s something that carries through to everything else you do in life – I regularly set goals for my academic life, some which I want to achieve in the next months and some which I want to achieve two or five years from now. This year’s group was particularly awesome and respectful, and super fun to work with. It’s great to be hanging out in the house with kids who are so smart and have so much interesting to say! In a lot of years the only athletes in the club are from Hanover High School (so Hanover and Lyme, New Hampshire, and Norwich, Vermont, and sometimes surrounding towns). This year there are four high schools represented and a home-schooled athlete as well. That made things a lot more interesting, and it was amazing how well everyone got along on their first real race trip. There’s also always the comedian of the group, and always one athlete who was quiet the first three years I showed up to coach but suddenly has become the group’s ringleader. People change so fast in high school, both athletically and on a personal level. So my annual Eastern Cup trip is a reminder: sports are a good an essential things for kids to do. Encourage your family, friends, and neighbors to get their kids to do sports! As many as possible! And coaching? That’s a pretty good, fun, and rewarding thing for grown-ups to do, too.